These sets offer a great selection of brushes for the price! Choose from eight sets containing Rounds, Flats, or a mix of the two in Bristle, Taklon, or White Nylon. Buy more and worry less about keeping them clean! 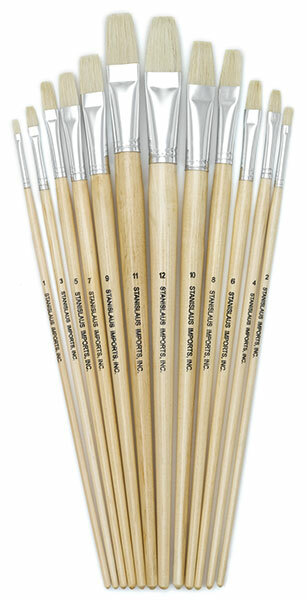 Each set contains 12 brushes in a graduated series of sizes. 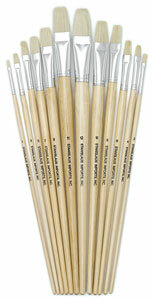 Flat Brush Sets — These sets contain one brush in each size, 1-12. Round Brush Sets — These sets contain one brush in each size, 1-12. Mixed Brush Sets — These sets contain Round brushes in sizes 1-9 and Flat brushes in sizes 3/8", 1/2", and 3/4".